Ladies fair, I bring to you, lavender of spikes of blue. Isn’t this a glorious day! Bright sunshine, not a cloud in the sky, birds singing…. One can’t help but think of spring when looking out the window. 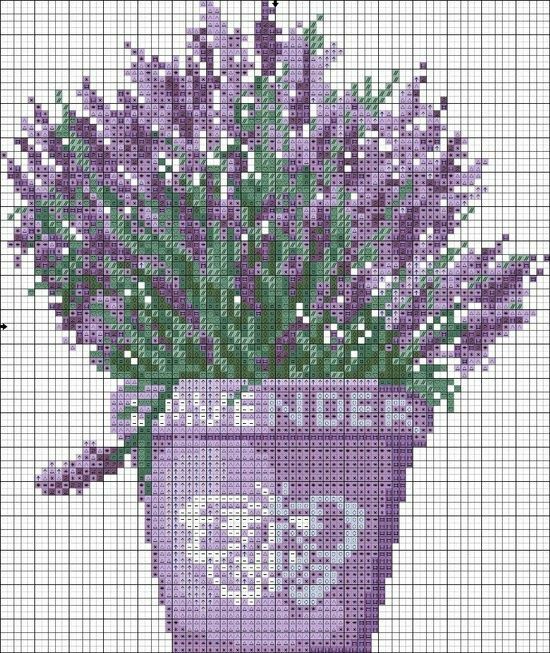 Because I am in such a ‘spring’ state of mind, I am including in this post a free chart called ‘Lavender’. Unfortunately the threads are not coded, but this would not be difficult to determine. Just pick your favorite shades of lavender, violet and purple, and assign one of the symbols on the chart to each color. I can guarantee that you won’t be disappointed. This will make a lovely pin keep or pillow tuck for a wooden bowl. Use your imagination! Sending warm spring like thoughts your way. May the road rise up to meet you…. I had a surprise waiting in the mail for me today. 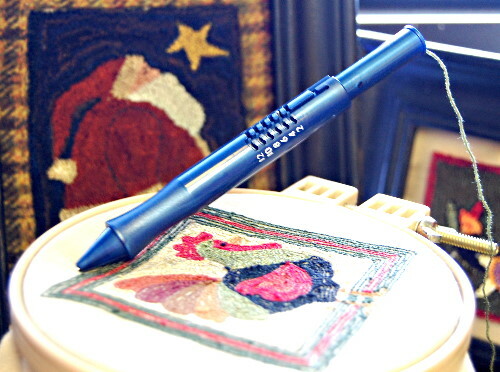 I received my punch needle for my newest needle art that I want to learn. I ordered it mid February on Ebay and was kind of surprised I hadn’t received it yet. When I got the package today, now I know why it took so long. It literally came from China. This little $4.50 needle came allllll the way from China. There has to a domestic (USA) source for this and it never occurred to me that it wasn’t coming from the US. The world has definitely become a much smaller place. Anyway, I got the needle, and I have absolutely no idea what to do with it. I do know that the final result will be beautiful (after much practice 🙂 ). I plan on checking out some youtube videos to see how to thread and use this needle. It’s a very convoluted and intimidating looking item. Afternoon, y’all. I have been on a Halloween kick this past week. No idea why. It’s not even remotely close to Halloween. 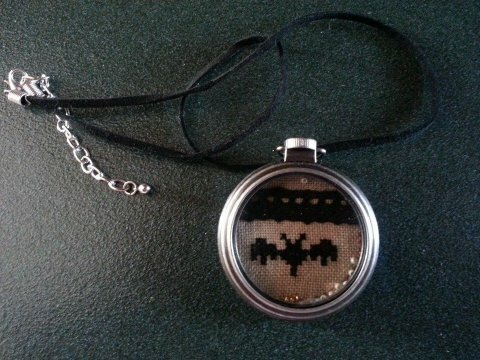 I stitched the raven above this week and then I also stitched this adorable bat locket. It actually is a watch fob. I plan on making some of these with a Christmas theme also. 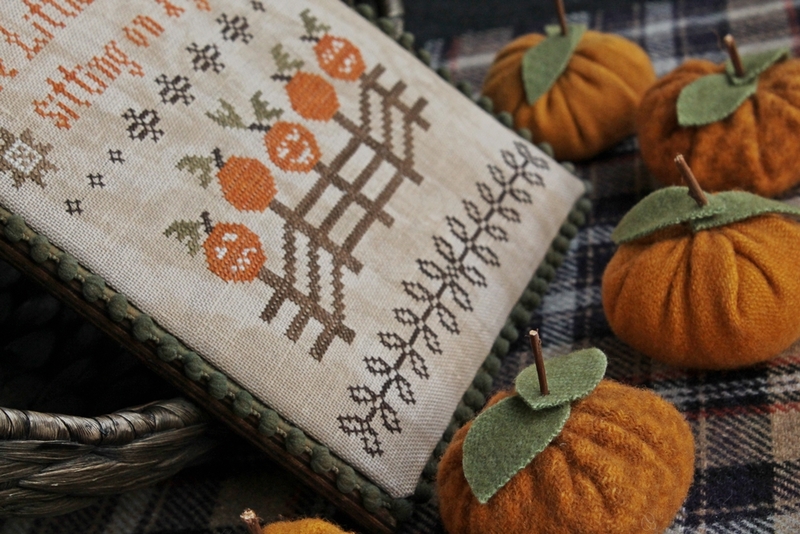 They are a quick stitch and would make cute, spur of the moment gifts you might need for unexpected guests or hostess gifts for those holiday parties. 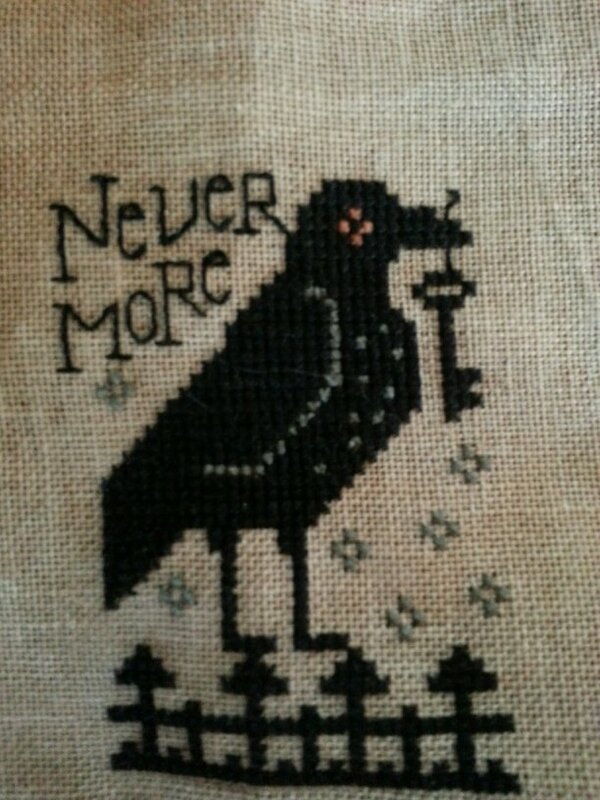 I am now working on the most beautiful piece of needle art that I think I have ever attempted. This is Lavender & Lace’s Celtic Christmas. 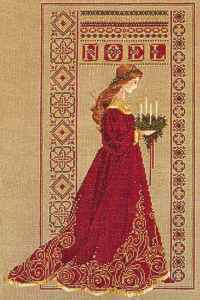 It is stitched with beautiful shades of reds, and burgundys and then accented with gold metallic threads. I have started it and plan to have it completed by Christmas. 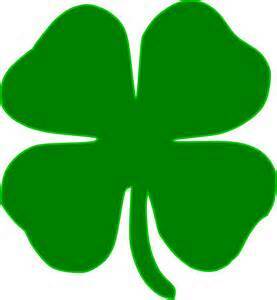 It will be my crowning jewel for 2015 if all goes as planned. Be kind to everyone. See you next time. Well, at least one project is finished. 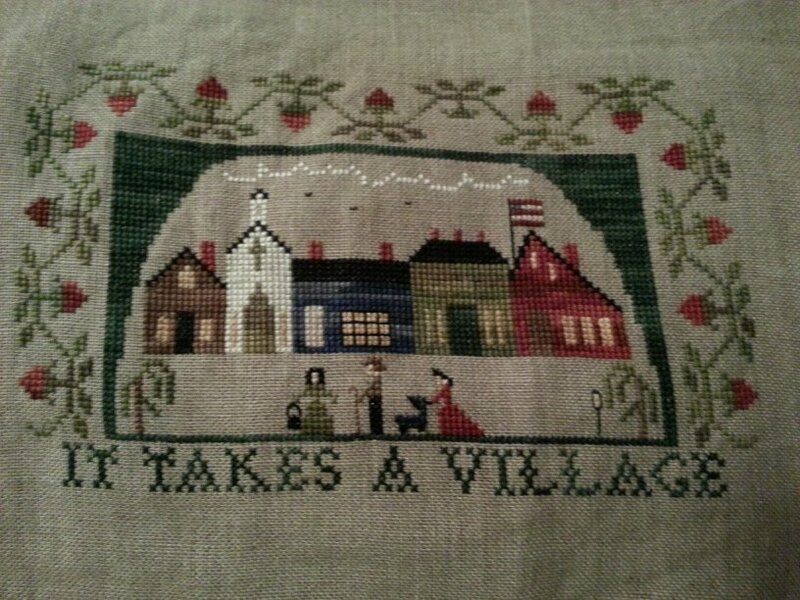 This is called ‘It Takes a Village’ by Homespun Elegance. I have stitched this on 30 count linen using my Valdani threads. I think this one will be framed since I can’t seem to find ‘just the right trim’ from my stash from so many years that I can’t remember. It’s a good feeling when a project is completed, but it will be even a better feeling when it’s REALLY completed, meaning the framing. I already know what my next project will be, but I don’t want to give it away yet. It’s really pretty neat and I think you will really like it. It’s a rather quick project and not intimidating. Well, it would appear that for most of us, March has come in like a lion. I don’t know about y’all, but I have had just about enough of this winter. I bet the properties for sale in the south will just fly off the market after this record-breaking weather. 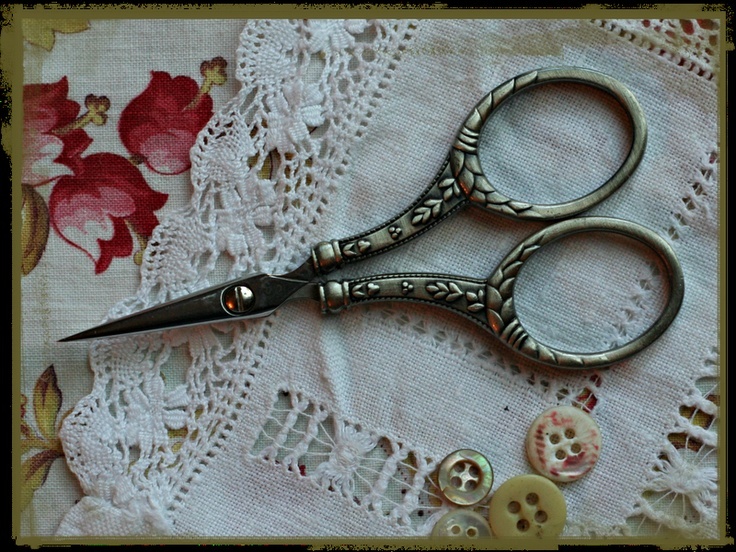 I stumbled across these lovely embroidery scissors today. When I stitch, I like to use things that make me smile and these made me smile. I can see in my mind’s eye, a needleworker sitting by the fire, quietly stitching with these, as her children played in the background. I have been very busy the last couple days and haven;t had a chance to work on my projects, but hope to change that soon. And for you, my friends, surround yourself with what makes you happy and brings you joy. As you know, one of those things for me, is needle art.